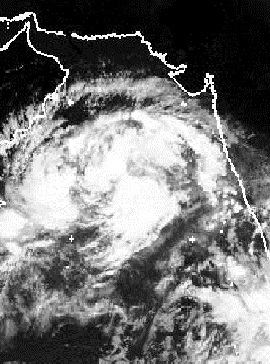 Sat Image os AS-2 as on 11.30 am IST Saturday. AS-2 has moved North in the last 6 hrs, and is positioned at 13.0N and 63.7E at 11.30 am IST. Still maintaining pressure at 1004 mb, the maximum winds are at 25 knts. Its spiral is growing, and is now spread over a diameter of almost 1200 kms across the Arabian Sea, while the outer spiral is now covering a distance of almost 1800 kms ! Expected to move NW and then North. Due to the SST at 29c, and other factors, it now may deepen marginally, maybe up to 1000 mb at the most. Coastal karnataka, Goa and Konkan should get rain on Saturday and Sunday as mentioned yesterday. The UAC in the Gulf of Mannar has deepened. Expect very heavy rains in the regions mentioned last night. Keep a watch on this too ! Mumbai already cloudy and windy.This is 3rd or 4th time in subsequent years for depressions to occur in Arabian sea during oct/nov/dec!! !This is inspite of record SWM during june-oct. Meanwhile rain over TN/south Andhra has decreased with less cloud coverage over Bay. Will NEM be bountiful over TN???? What u write is correct..thats why i said...keep a watch on the south system also. Thanks all for the Divali greetings ! Wish you and your family the same..and happy "weathering" on vagaries. sset:systems in the arabian sea in oct/nov are not so uncommon...mumbai (then Bombay) was directly hit by a strong cyclone , its worst direct hit...on 18th nov 1948.
correct Rajesh - 1948 super cyclone indeed hit Mumbai Virar in month of November!! Amazing to me. Infact this august times of India did publish a vintage/historical article on this in same fonts/style as it was done in that period (1940s).